Travel with Kevin and Ruth! : Always love to get a great deal! Always love to get a great deal! Went out for a 9 km (5.6 mile) walk yesterday before lunch. Took us an hour and a half, so we had a pretty decent pace going. Not that scenic though... just went through a few neighborhoods here in Hamilton, Ontario, and then up on the escarpment that gave us some views, although the views weren't that spectacular! Hamilton is an industrial city, with 60% of Canada's steel supply being produced here by both Stelco and Defasco. Good workout on the stairs up the escarpment! You can just make out the skyscrapers of Toronto across Lake Ontario. Bright yellow house, with a pink door! It doesn't really fit in with the neighborhood! Nice old homes from the 1930's. We had a good walk though, and got home hungry for lunch. After lunch, we had some shopping to do! We don't get dressed up very often, but we have a wedding to go to on Saturday afternoon. Ruth is borrowing a dress from her sister, but I needed something to wear! I do have a suit packed away somewhere at Ruth's father's place but I would need to buy some dress shoes. And our daughter would have to bring it down with her. Instead, we figured we would stop in at the local Salvation Army and see what they had! I had my Tilley pants with me, so didn't need any trousers. But I picked out a dress shirt and a tie. And then came across a Harris Tweed blazer, and a pair of brown leather dress shoes that fit well enough for one evening. Total bill... $26 CAD ($21 USD). At that price, if it doesn't fit in the luggage, I won't mind leaving it behind. 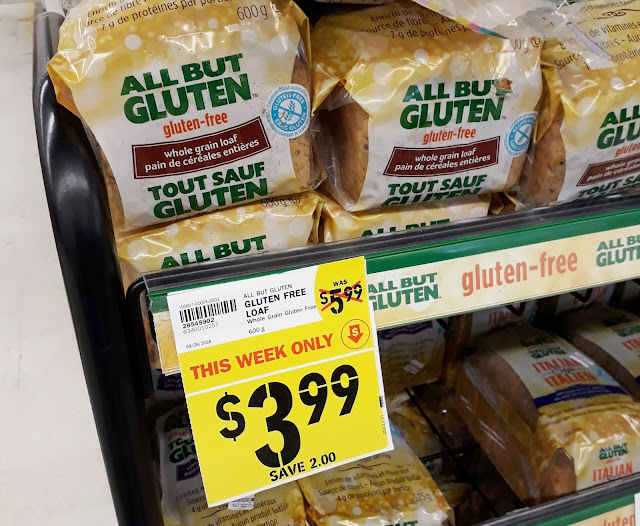 Gluten free bread in Canada normally costs between $6 to $8 CAD a loaf. Pretty rare to ever see it under $5, so $4 is a great deal. And, this is one of the better brands of gluten free bread. We are here for almost three more weeks, plus our daughter Lindsey eats gluten free as well. So we snagged six loaves and put them in the cart. Here in Canada. we have a price scanning code of practice where if the price on the shelf is lower than the scanned price, you get that item for free. In this case, all six loaves of bread went through at the higher price. Over to the customer service counter, where the girl said that sale had ended the day before. So yes, we would get one loaf for free, and she would credit back the $2 per loaf on the other loaves. I had paid with a credit card, but she just handed me back $19.95 in cash. It was only when we were back in the car that we did the math and figured out that she had given us too much change back. The credit should have been $6 for one loaf of bread, and $2 per loaf for the other five... so $16. She had actually given us a credit based on the five loaves of bread at $3.99.... $19.95. So in the end, we got 6 loaves of gluten free bread for $16... or $2.67 per loaf! Today, we're off to visit a friend in Fergus, Ontario and then into Guelph where we have a room in an AirBnb rental for two nights. Also meeting our kids and grandkids who will be arriving in the same area this evening! 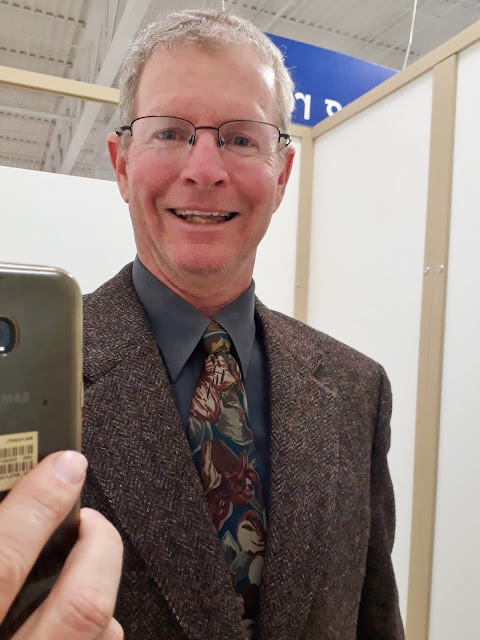 Great deal on the clothes, you look great - that is why 99% of my wardrobe comes from the thrift stores. One thing to note - not all stores participate in the scanning code of practice, Thriftys/Sobeys does not. I left there store super mad one day after having that discussion with them. I rarely shop there, only if there is a smoking great deal. Yep, the majority of our wardrobe is thrift shops too. Apparently the scanning code of practice is volunteering, I thought it was some type of law but I guess not. We will have to keep that in mind and avoid Sobeys unless like you said they have some kind of smoking hot deal. Did you find out anything about the Yellow house? Might have a story:) Thanks for your always entertaining posts. I look forward to your posts in my inbox everyday. No we didn't find out anything on the yellow house. Maybe the owners just wanted their house to stand out and it certainly does. I thought it looked very bright but I sort of liked it until I saw the pink door! We love going to towns/cities where there are a bunch of bright colourful houses together. I love the old houses in Ontario, the yellow one is a bit loud, but the style is great. Good deals on the clothong and bread! The area where my sister lives is definitely the old part of Hamilton and most of the houses around are old and beautiful. They have so much more character than any of the newer ones being built these days. I sort of liked the yellow one, but I didn't like the pink door! I love quirkiness so love the bright yellow house....why do people tone down everything? Nature is full of bright colors i.e. rainbow, flowers, sunset, sunrise and we all love that so why not use them to paint houses? I have a bright red door. BTW Kevin looks handsome in his salvation army duds. I too am a fan of second hand store shopper...amazing what people throw out. Also, love the photos of Toronto in the distance. I only went to Toronto once and a hot dog was $6.00....no thank you! Instead I ate my turkey sandwich I had packed that morning along with vitamin drinks. Nice to visit but wouldn't want to live there. I agree, we liked that quirkiness about it as well, just didn't like the pink door. We love seeing nice colourful houses but we like it more if we can see a group of them together, like the Bo-Kaap neighbourhood in Cape Town, SA or in Campeche, Mexico as well as Lunenburg, Nova Scotia. Enjoy the wedding! While in the Guelph area, if you get a chance to go hiking at Elora Gorge, it is a beautiful spot! Thanks! We will go to Elora Gorge today! You guys always seem to come out ahead good for you. Nice jacket Kevin. Enjoy your visits with the kids and grand kids. We like the Salvation Army, whether traveling or not. We like Goodwill, too. I looked to see that they are also in Canada. On one trip by RV through, my only souvenir was was a set of knives and 2 knife blocks for $3 from the Goodwill. I kept the knives I wanted, used the chef's knife to learn better how to hone a knife on the Scarry sharp system and cut my finger with it, used the knife blocks for my favorite knives and gave the rest to a friend for their camping set up. We have to admit we use thrift shops a lot more since we started traveling than when we actually lived in a house. Gotta love deals like that, and plus the clothes you got as well, I peck up a lots of things at the thrift store when I can. Yep, the thrift shop worked out well for our wedding attire, or I should say Kevin's wedding clothes, all I needed was a black sweater. My Suits are stored but I carry a Sports Suit while Kathy carries a nice Pant Suit just in case. Great Price. We used to carry around a sports jacket for kevin and a nice dress for me but we found we rarely ever needed them so we got rid of them. You have a lot more room in your 5th wheel than we do in our motorhome. Plus we didn't have the motorhome with us and our Swoop flight charges you extra for anything bigger than just a small regular backpack so we only brought one small bag that we have both our things in for our whole three week visit. Looking pretty sharp there Kevin!...Ruth should check all your newest incoming Emails..
After your recent travels in BC and Yukon, I'm not surprised you find the scenery a bit, well, flat. That's for sure, but Hamilton is a steel town and the big steel plants don't make for real pretty scenery. Kevin, if you and Ruth go back to Europe in cool weather again, that nice warm Harris tweed would really be in style on the city streets with a pair of denim jean pants and a pull over knit shirt with a collar. The university professors and preppy guys (senior class men) are wearing them all over the place. Lots of people to visit in this area! Finally, Sherman's repairs are complete! This is becoming a frustrating problem. Getting lots of use with our new bikes! Repairs done, and back in Canada! A short hike is better than no hike at all! It's a good thing we like it here! Arrived in time for happy hour!